This popular and established series has been completely revised and updated. The series has been written by highly experienced teachers especially for students studying for the CSEC General Proficiency examinations. The books have been written to make it easy to study a whole topic from scratch, or to seek out answers to specific problems. The new editions include interactive CD-ROMs offering further study on challenging topics with the syllabus. The wide range of activities, animations, videos, games and experiments offer a new and exciting way for students to learn, as well as greatly increasing their enjoyment in the subject. A markbook and feedback for every question allows students to monitor their progress and encourages learner independence. 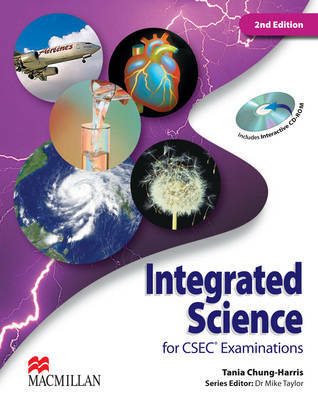 "Macmillan Science for CSEC[registered] CD-ROMs" are also available to buy as standalone items. This title covers all sections of the latest CSEC syllabus. Learning objectives are stated for each chapter. The books form a useful reference resource for teachers. Keywords highlighted in the margins form a glossary. Diagrams and photographs with captions illustrate important points. Table summaries and diagrams provide all the essential information for less able students. Questions in the margins enable students to check their understanding as they read. Multiple-choice, short answer and essay questions as set in the examinations are given for practice at the end of each chapter.